A recent study shows that a few seemingly simple ideas will pay big environmental dividends – Project LIBERTY will actually offset more greenhouse gases than it produces. When POET planned to build their cellulosic ethanol plant, Project LIBERTY, next to their existing refinery, POET Biorefining – Emmetsburg, they knew it made good economic sense. The roads and power lines were already in place. POET already had 700 or so farmers delivering their grain to POET Biorefining – Emmetsburg, and those same farmers could come to the same site and bring corn cobs and crop residue from those very same fields. They knew that the byproduct of the cellulosic ethanol process, lignin, would make an excellent fuel for an alternative energy system. This waste product from the cellulosic ethanol plant, they figured, could be turned into a biogas, mostly methane, which could then be used to power the facility. And a recent study has shown that the co-location of the two biorefineries makes outstanding environmental sense as well. The independent study, a life cycle analysis of Project LIBERTY performed by Air Improvement Resource, tracked the carbon emissions associated with creating and burning a gallon of cellulosic ethanol versus creating and burning a gallon of gasoline. This “field to wheels” analysis determined that Project LIBERTY will reduce carbon emissions by 111 percent over gasoline. That means that Project LIBERTY will actually offset more greenhouse gases than it produces. And while Sturdevant knew that the Project LIBERTY plant would fare well against any fossil fuel facility, the final number surprised even him. The factors in the Project LIBERTY study included everything associated with the biomass process–harvesting the cobs and crop residue, transporting it, storing it, converting the biomass into ethanol, producing the coproducts (like biogas), and storing and transporting the ethanol. In addition to these numbers, the researchers also had to plug in certain values, some of which have been questioned by POET, as determined by the Environmental Protection Agency’s Renewable Fuel Standard (RFS2) (see “Adapting the Standard”, Vital, Summer 2010). Those anaerobes, micro-organisms that break down biodegradable material and turn it into biogas, will be the key behind eliminating the need for natural gas at Project LIBERTY while significantly reducing the need for the natural gas at the adjacent corn plant as well. By the end of the process, virtually all of the biomass brought into Project LIBERTY will be converted into something useful. Even the main waste product of the biogas process, a relatively clean water, is recycled in the process. And the other waste product often associated with anaerobic digestion–the smell–will also be refined. According to Bootsma, the synergy–and simplicity–of co-locating the two plants is one of those technological breakthroughs brought on by sticking to the basics. It’s that common sense, from-the-ground-up approach that continues to put POET at the forefront of what is essentially a new industry–the first commercial-scale harvest of corn cobs and crop residue for cellulosic ethanol. “Feedstock collection represents what is potentially a huge shift in agriculture that we haven’t seen in a long time,” says Chad Schell, Project Officer with the Department of Energy, which has committed $100 million to Project LIBERTY. “Look at the traditional corn ethanol industry and how far it has come since its inception. For example increases in efficiencies that have been made are substantial. We often compare ethanol to the oil industry. The oil industry’s had a 100-year head start, so ethanol’s got a lot of catching up to do in terms of process efficiency, but they’re catching up fast. Like with any new industry, though, it is those involved at the ground level that, out of economic necessity, move the technology forward. And it’s the farmers who continue to drive the technology forward. More than 85 Emmetsburg area farmers signed on to harvest biomass for Project LIBERTY in the fall of 2010. POET had to turn away many others. Schell understands that every step in the process is a step forward for the future of cellulosic ethanol. For POET CEO Jeff Broin, the recent life cycle analysis of Project LIBERTY reinforces the reasons to keep moving forward on all fronts. POET, though, can’t do it alone, Broin stressed. POET’s common sense, keep-it-simple approach continues to generate the greatest results. Sure, the scientific studies – with statistics like a “111 percent reduction in greenhouse gases” – prove the points, but it’s that in-the-field experience and attention to detail that drive those original decisions. 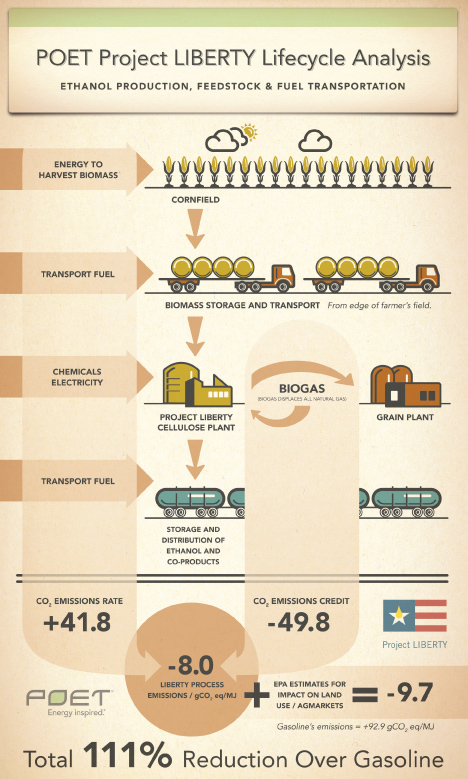 How does POET make cellulosic ethanol? Visit, projectliberty.com to view POET’s “How to make cellulosic ethanol” video. YouTube: "How to make cellulosic ethanol"